The disgusting incident on the Great Western Railway service from Devon to London left Florence Beasley, 23, wretching. 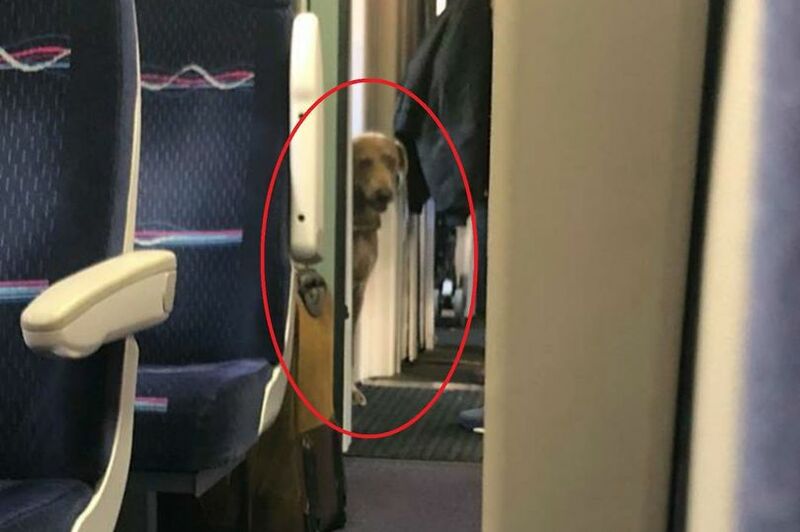 Passengers experienced a train journey from hell after a dog suffered an “explosive bottom” in the middle of the aisle. Train-goers on the packed journey were forced to use magazines to weigh down the paper laid on top of the mess by train staff, who did not actually clean it up. Travellers were left gagging from the stench for four hours until the train reached its destination. The incident happened on the Great Western Railway (GWR) service from Devon to London on Sunday. Florence Beasley, 23, from London, has formally complained to GWR after spending £36.15 for her disastrous journey from her home in Newton Abbot, Devon. Taking to Facebook, Florence shared photographs of the mayhem on board. She wrote: “This happened on my train home today. He had an explosive bottom. “He wasn’t embarrassed. He admired his work for several hours after that. 0/10 bowel control. 13/10 would not like to sit near this for four hours again. 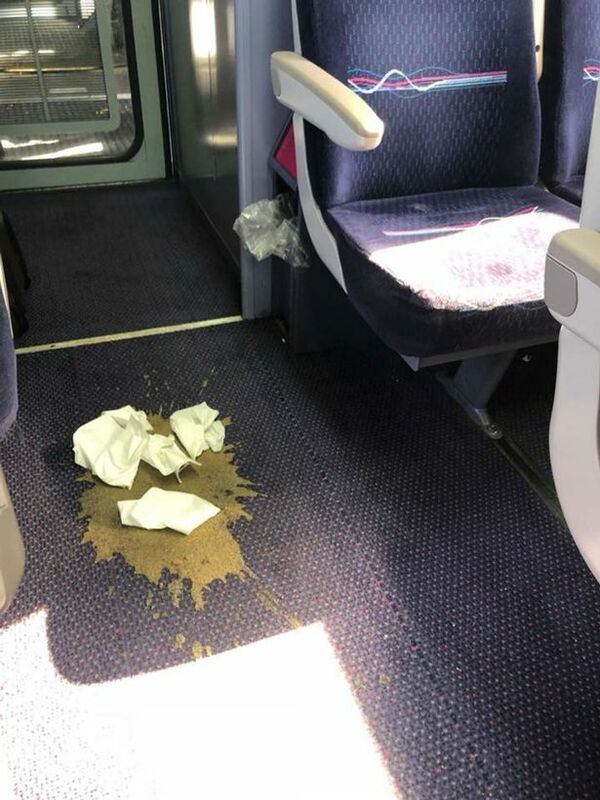 The first photograph shows a large puddle of brown mess in the aisle of the train – with some pieces of tissue strewn across the top. Florence explained that this was done by a father who had young children with him in the compartment, in a vain attempt to cover the smell. The second photograph shows a pile of blue roll tissue placed over the top of the mess – while the poor dog stands in the background staring at it. Florence has since lodged a complaint with GWR due to the incident. In a letter to the train line she wrote: “Within 20 minutes of departing a dog had explosive diarrhoea in the aisle. The train was full and there were no staff in sight. “The owner stayed at the scene to try and warn people not to step in it. After five minutes of me knocking on the staff door as the cafe was closed someone finally answered and didn’t attempt to give anything to clean up or cover with. He said he’d be up in a minute to check the situation. 75 minutes later when we got into Bristol the train staff appeared and said there were no staff to clean it up. Speaking today, Florence said: “In all honesty I have grown up on a farm and around dogs so I’m used to it, but being in such a confined space is difficult when that happens and I had to sit next to it for a long period of time because the rest of the train was full. She added: “I mostly felt sorry for the owner. The staff weren’t willing to give anything to help him clean up which he would have done had he had cleaning products. Florence said she felt for the dog owner who apologised to his fellow passengers. She said: “He was very embarrassed but I chatted to him a little and told him not to worry. It doesn’t make a difference if it’s a dog or a baby. A Great Western Railway spokesman said: “We are aware of this incident, and have apologised to customers affected. The only dogs that should be allowed on public transport should be guide dogs. I hope the poor dog feels better soon, given how short dog digestive systems are, the sudden illness must have taken both the dog and its (obviously mortified) owner by surprise. 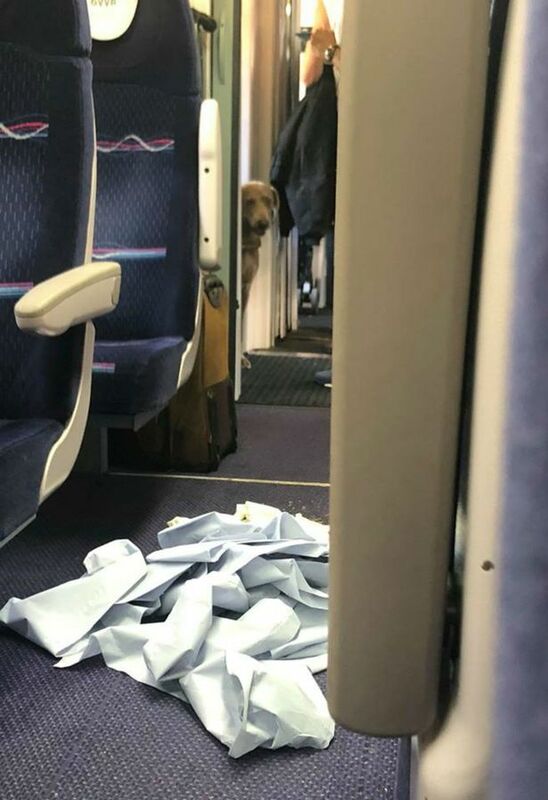 Poor show on having no cleaning materials available, it’s not just explosive dogs that can happen on trains to make them a grim place to be!